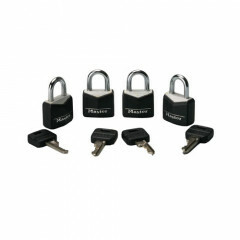 These are 3/4" Solid Brass Padlocks With Black Vinyl Cover & Black Covered Keyhead. They are durable, weather resistant and will help keep things safely locked in. You'll get 4 padlocks and keys in each set and they are all keyed alike. Perfect for any lockable device, cuffs, collars, CBT toys and devices that lock: Gags, Muzzles, Head Harnesses, Hoods... all leather items that have the lockable buckles.